If you can judge a nation by how it treats those in most need, the judgement on this nation is damning. Those with the highest needs are effectively being attacked by a government for a circumstance they had no choice in: being disabled. It is a damning indictment of this government that they have launched attack after attack on disabled people leaving them without support and removing income. The proposed closure of the Independent Living Fund (ILF) is the latest in that assault. Five severely disabled people whose right to live independently in the community and who face having their lives trampled on by a decision which has never been discussed let alone voted on in parliament have vowed to carry on their legal fight against the callous Coalition government’s proposed closure of ILF. While Conservative MPs around the country continue to churn out platitudes that their party will protect the ’most vulnerable’ the reality of what their ministers are actually doing is far different. The loss of the Independent Living Fund will have disastrous consequences for disabled people with high support needs and as DWP and Local Authorities have said will result in people being forced back into care homes or left in danger in their own homes. How many will have to be abused or die through neglect before society takes this threat seriously enough to say this is a cut too far? Anyone of you could become disabled and need this level of care to keep living in your community or at home with your family and friends. This is not about party politics this is about justice, morality and dignity. It is about the right to continue to have a life worth living if you do become disabled at some point in your life. All five will appeal the decision handed down in the High Court on April 24th claiming that the government failed to meet its Public Sector Equality Duties when carrying out what they claim was a flawed consultation process. DWP have previously said that the ILF fund was unsustainable. They fail to clarify as part of the consultation if there will be any guaranteed on-going extra funding devolved to local authorities to take over the additional costs of meeting people’s care and support needs after 2015. Something which could be a slap in the face for already hard pressed Local Authorities whose budgets are already being squeezed by a further 28% and who will have to implement these cuts. Please support the five and write to your MP to say this is a cut too far. After a year of very hard work and wonderful encouragement from all of our friends and supporters Pat’s Petition closed with over 62,600 signatures. We then sent an open letter to Liam Byrne. and we have a result. Liam Byrne has been in touch and the Labour Party are giving us an Opposition Day Debate in the Commons based around Pat’s Petition. This means the debate will take place in the Chamber at the House of Commons with Ministers and front benchers as well as back benchers. So fantastic news – Pat’s Petition is moving to Pat’s Debate. Tell everyone – shout, sing, tweet using hashtag #PatsDebate. Let’s shake this government into listening to us at last. The debate will probably take place some time in January and we will only have a weeks notice so the important thing now is to get ready for the debate and make sure all the issues we have been campaigning on get attention. The theme of the motion for the debate will be the Pat’s Petition demand that the government – Stop and review the cuts to benefits and services which are falling disproportionately on disabled people, their carers and families and a demand for a Cumulative Impact Assessment. It’s a very wide brief so if you want to focus on a particular issue that’s fine. We will need lots of help from you all to make sure that after all your effort this debate gets real results. We are hoping that many of you will put up blog posts in support of Pat’s Debate and that we can collect the links together here. 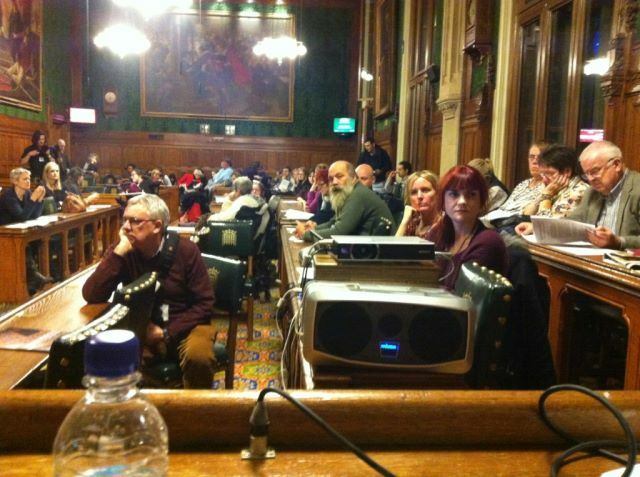 We will also need your help to ask MPs from all Parties to speak in this debate and if we can direct them to your blog posts it will show them the kind of messages we want to put across. Watch this space to see how the plans for the debate are progressing. Please get behind this debate and make it a game changer.